Janel Leppin and Anthony Pirog are two accomplished multi-instrumentalists who grew up in Vienna, a charming Northern Virginia town that is part of the Washington DC metropolitan area, where they attended the same high school. During those years, they began playing together at Leppin’s home village of Wedderburn, though they only started performing as a duo in 2005. Their eponymous debut album was released in 2006, and since then the duo has attracted a lot of attention on the independent music scene. The memory of the two musicians’ idyllic teenage years and the loss of the Leppin family home (converted into yet another housing development) is the inspiration behind Where Is Home, their sophomore effort, released in the summer of 2012 after three years of steady work. Janel and Anthony have different, yet complementary musical backgrounds: Pirog, a Berklee graduate, is a guitarist with a jazz background and an eclectic attitude, while Leppin is a conservatory-trained cellist deeply influenced by North Indian and Persian classical music. Those wide-ranging sources of inspiration converge in the duo’s musical output, which even the most obsessive classification geeks would find it hard to label, and even harder to compare to other acts. Seamlessly blending acoustic and electric instruments with cutting-edge electronics, enhanced by a discreet sprinkling of percussion (though without drums), Janel & Anthony’s music possesses a uniquely intimate charm and gently wistful tone that would make it the ideal soundtrack for a crisp autumn evening. Though the instrumentation featured on the album is surprisingly rich, the compositions hinge on the sleek interplay between Leppin’s cello and Pirog’s electric guitar on an entrancing backdrop of skillfully employed loops. the high level of complexity is realized with an elegant subtlety that contrasts with the over-the-top antics of so many modern prog acts. The elegiac nature of Where Is Home – steeped in the nostalgia for a bygone era, and suggested by most of the track titles – unfolds gradually, as opener “Big Sur” is jaunty romp with the heady Eastern flavour contributed by Leppin’s sitar and Saarang Maestro DX (a digital version of the tanpura, a long-necked North Indian lute), while pizzicato cello lends a sharp, almost percussive rhythm that complements the insistent chime of Pirog’s guitar. Then, “The Clearing” marks a shift in tone, introducing a slight element of dissonance in the track’s sedate, meditative mood vaguely tinged with menace – a mood that continues in the haunting “Leaving the Woods”, based on a slow, measured conversation between guitar and cello, which sometimes merge, sometimes go their separate ways. The longer tracks are interspersed by short, ambient-like interludes mostly based on electronics, though the album itself runs at a very restrained 46 minutes – the ideal duration for such a sophisticated, mood-based effort. While the cello-driven “Lily in the Garden” exudes a lovely autumnal charm, intensified by the almost monotonous pace of the guitar, “Mustang Song” sees Leppin and Pirog engage in a bracing guitar-based duet, shifting from a soothing, melodic tone to a more assertive one. In “A Viennesian Life” two mellotrons (one of them courtesy of sound engineer Mike Reina) are brought in to add further layers to the lush atmosphere of the piece, in which several different strains play at the same time and are expertly meshed by the two musicians. In contrast, the longest track on the album, the almost 8-minute “Broome’s Orchard” has a more straightforward structure, and the many instruments involved act discreetly, without disrupting the sparse, meditative mood of the piece. Finally, the middle section of “Where Will We Go” introduces atonal elements and eerie electronic noises, bookended by more melodic parts. An exquisite album that conflates impeccable formal skill with genuine feeling, Where Is Home is highly recommended to lovers of chamber-rock and instrumental music that privileges atmosphere and emotion over complexity for its own sake. 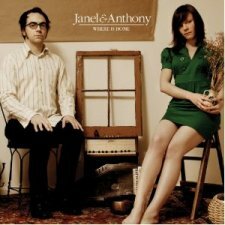 In spite of the “avant” tag that Janel and Anthony’s association with Cuneiform Records or events such as the Sonic Circuits festival might evoke, the album is surprisingly accessible, and will hold an almost irresistible appeal for those for whom music means more than just a backdrop to everyday activities. Lovely notice Raffaella, must investigate! Thank you, John! This is an album you will definitely appreciate. Thank you so much, Jason! Looking forward to review the new Herd of Instinct! Thank you so much for dropping by, Ian! I was happy to read that EppyFest went well.